The company originated in 1878 when a bill to develop the Gosport Street Tramways, a subsidiary of the Provincial Tramways Company Ltd was promoted. No results were evident until 17th July 1882 when 8 horse cars ran a 7½-minute headway route from Gosport Beach (now the ferry) via Elson Road to Brockhurst. This was one of the many Provincial Tramway systems in Portsmouth, Cleethorpes, Devonport and Cardif. The Gosport and Alverstoke Urban District Council decided to acquire the system within their boundary at a meeting on 20th October 1900, but a legal complication stopped them taking this course of action. A similar action was proposed in 1956, but got no further than the council's minute book. 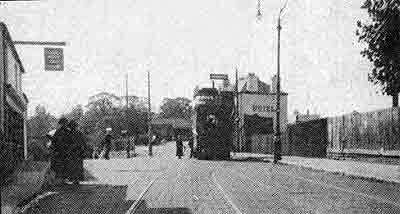 The Brockhurst route was extended to Fareham Railway station and electrified commencing 24th January 1906. A bill to change the Companies legal name to Gosport and Fareham Tramways was proposed in 1906, but not proceeded with. It was however, duly adopted as the fleet name. A bus service form Bury Cross to Lee-on-Solent was opened up by the tramway company in 1910 and later extended to run from Brockhurst to Lee-on-Solent . The 1914-18 war terminated bus operations and in the early post war years a large number of one-bus operators appeared in the Gosport and Lee areas and through the 1920s competition with the trams grew fierce. In 1929 the Bury Cross route was converted to motor buses and the Fareham route cut back to Ann's Hill. The last trams ran on 31st December 1929 and the company changed its name to the Gosport and Fareham Omnibus Company. Seven tramcars went to nearby subsidiary of Provincial Tramways, the Portsdown and Horndean Railway, which continued until acquired by Southdown in 1935. Six cars went to the Great Grimsby system, also a Provincial Tramways fleet. The replacement buses were mainly three axle Chevrolets. these were replaced by deliveries of AEC Regals and Regents, the majority of which were still in service up to the early seventies. 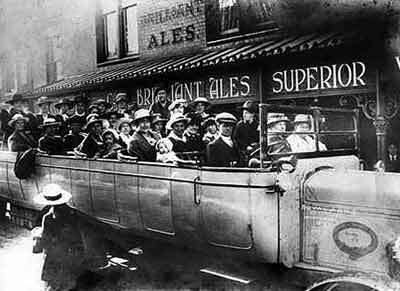 Some of the Chevrolets were transferred for, further service in the Cleethorpes fleet. The intensive network of services radiating from the Ferry, Haslar, Elson, Fareham Railway station and West End Estate, and a number of circular routes in Gosport were built up before the Second World War. The Company was hard pressed during the war due to the many service establishments in its area of operation; at the time of D-Day, even the veteran Leyland's saw service. Since the war the large Bridgemary estate has been served, and open toppers popularised the Stokes Bay route. One-man vehicles were introduced after 1953 on four lightly patronised routes. With nationalisation imminent, the private hire department was detached in 1947 to the parent company, Provincial Traction Company. Since 1936 the company had been the sole survivor of the once large Provincial system. "Old Bill" Provincial's (at the time) beautifully restored 1922 Leyland G7, which is still preserved but in its original Southdown livery. This picture was taken at the 1951 Gosport Carnival in which it always took part, and this year won first prize. Between 1947 and 1954, all additions to the fleet were new vehicles, initially AEC and later Guy. From 1954 to 1968, with the exception of two Guys in 1958, second-hand vehicles were acquired and existing vehicles rebuilt very extensively and re-engined and rebodied. Eight acquisitions were necessary to plug the gap caused by the fire at Hoeford depot at midnight on 18th June 1957. Four double deckers, a coach, a derelict saloon and two new lorry chassis stored for dealer were destroyed. One double decker and four saloons were damaged. In 1968 and 1969 two batches of Seddon Pennines were purchased to expand one man operation, and the double deck fleet was considerably reduced as a consequence. Further second-hand vehicles of AEC and Bristol types were acquired in 1969 and 1970. Six new Roe bodied Daimler Fleetlines were on order for 1971, but these were diverted to Hants and Dorset at the NBC takeover, and six Bristol RELLs arrived instead. One of the two guys (70/71-SCG622/3) no 71 is pictured above. It is a Reading fully fronted bodied Arab IV - Photo Cliff Essex). In March 1969 the parent company Provincial Traction Company Limited (so renamed in 1936) was taken over by the Wiles Group and from 20th May 1969, this group was renamed the Swain Group. On 1st January 1970, the bus operations were sold to the National Bus Company, the head office of GFO Co being transferred to The Square Bournemouth. 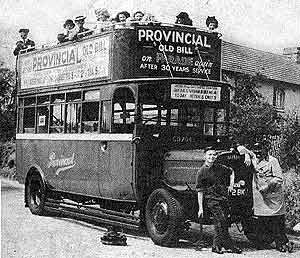 Hants and Dorset Motor Services now administered the company, although Gosport and Fareham Omnibus Company remained the legal owner. Day to day control was still conducted from Hoeford and the fleet was operated as a separate entity. It also remained leaf green when H&D became poppy red. In the late eighties after deregulation the company was bought from NBC by its management and employees and became Peoples Provincial. First Group acquired the company in the 1990s and it is now part of First Hampshire along with Southampton Citybus. By this time Peoples Provincial had expanded into Portsmouth and Harry Blundred's "bread van" operation (Red/Blue Admiral) had also been taken over by First and combined with Provincial in the new First Provincial Company. The garage and offices were at Hoeford, near Fareham, alongside a stream called the Hoe. This provided the water for the tramway generating station and also formed the Gosport/Fareham boundary. Another generating station was near Ann's Hill Cemetery. 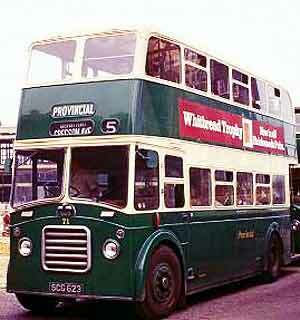 The livery of the fleet was emerald green with cream bands above and below the lower deck windows on double deckers. On Saloons and coaches there were cream bands above and below the windows. The fleet name Provincial in script was on the side panels. Fleet numbers were carried on the front dash and rear, where they were surrounded by a garter with the company name in the belt. In the spring of 1969, the livery of saloons was altered to all cream above the waistrail and the script style fleet name on stage carriage vehicles was replaced by one in normal capital letters in a horizontal line. From June 1969, the double deckers were repainted with cream window surrounds on both decks and cream roofs. The garter fleet name around the rear fleet number was gradually abandoned in 1970, small white fleet numbers being applied to both sides just below window level near the front from early 1971. On NBC take-over the livery was leaf green, with white bands in later days. Peoples Provincial restored the old Provincial emerald green livery along with the garters, but eventually opted for a more cream based livery with dark green bands in its latter days. On the take-over by First, a red and cream livery was adopted, but increasingly as new vehicles join the fleet the Corporate "Barbie" colours are becoming more common. Assuming Rudolph is in front, the number of possible way to arrange Santa's other eight reindeer is 40,320. Divide your weight by six to get the approximate number of quarts of blood in your body. A rat can go without water longer than a camel can. The Monongahela River's name translated into English means "high banks breaking off and falling down in places."